Hey all! Life has been fairly crazy lately, as I’m sure you’ve been able to tell…since I’ve lately had to change my post schedule from three days a week to once a week. A 9-5 can take a lot out of you, and this time every year is the busiest for me. This year seemed particularly more busy and stressful, which caused my poor blog to take a backseat! I’ve been working hard to keep up with my own ventures. Once I start and work as hard on something as I have on this blog, there’s no way I’m quitting that easily! Anyway, things have calmed down a bit and I feel fairly burnt out…it’s not often I get a legit vacation. However, now is the time! 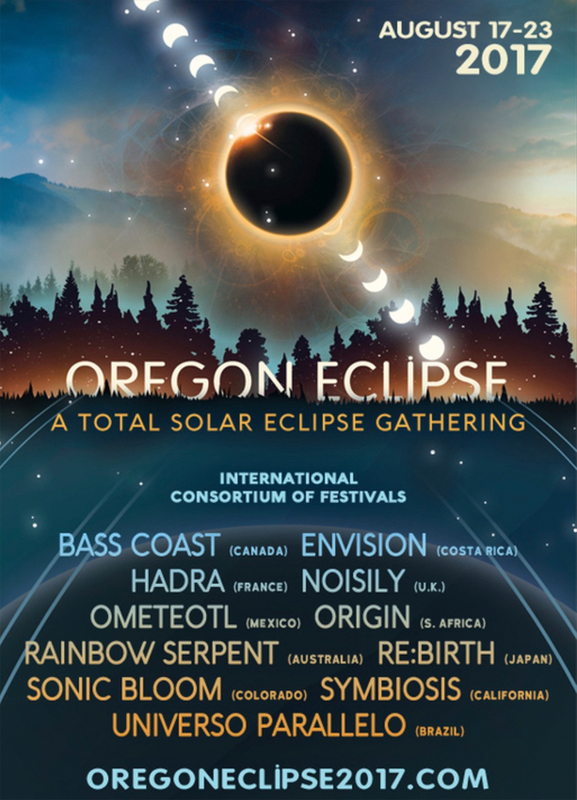 I’ll be heading up to Oregon to see the full solar eclipse at the Global Eclipse Gathering, put on by the Symbiosis festival out of California and other major festivals from around the world. This is the first time a full eclipse has traversed across the United States in 99 years, so it’s a pretty significant deal! Just about every artist that has graced flyers across the global festival circuit will be there, most of which will take care of my entire artist wish list. Over 30,000 people are expected to pour into Big Summit Prairie in Oregon, and I have never been to any event of that size. My husband and I are driving all the way up, and I’m way too excited…this is such a much needed break! I hope more of you get the chance to experience the eclipse, or at least the partial eclipse from wherever you are. You can find more information about traffic, weather, and where it is expected to be visible, here. 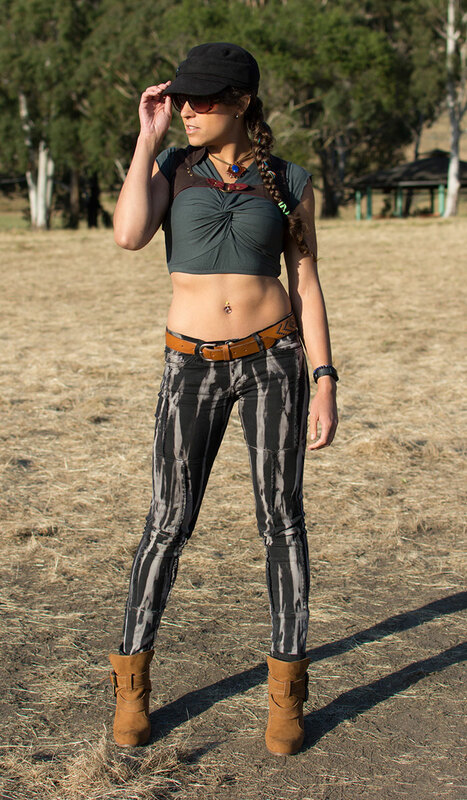 Style wise, I’ll be wearing all of my favorite sustainable, organic and/or independently-designed festival apparel. I may or may not take photos, as sometimes with awesome events like this you forget you even have a camera! I will return on the 28th, and depending on how much catch-up I have to do after that, I’ll hopefully be back to my regular posting schedule of three days a week again. Either way, I’ll see you all again soon. If you haven’t yet noticed, music festival life is at my core along with my affinity to denim and sustainable, ethical apparel. It’s rare to get all three together! Last May, I had the awesome opportunity to review a pair of eco-friendly, Burning Man inspired jeans from a San Frandisco-based brand that definitely deserves more recognition, Sonas Denim. I was stoked to discover a company that fit all three, AND donates a portion of proceeds towards future construction of an animal sanctuary. It just so happens that this is one of the main things I would do if I ever won the lottery! Of course I had to present this brand to all of you, my readers. They are definitely now one of my favorites and I still talk about them with all my friends and acquaintances, especially those in the festival circuit. Top: Maddie Moon. Vest: Maddie Moon. Jeans: Sonas Denim. Booties: American Eagle Outfitters. Necklace: Third Eye Pinecones. Ok. I’ll warn you ahead of time, this is going to be a long post, but I’m quite excited to share this subject brand with you guys! There’s really never any time when I receive a pair of jeans to review that I don’t like, as it’s always cool to try out and report on a variety of different styles. There’s usually something about brands that I work with that I completely respect and jive with that makes me add them to my ever growing list of favorites and makes me excited to share them with all of you! However, rarely is there a time when I discover a brand that truly hits home to me from every angle. 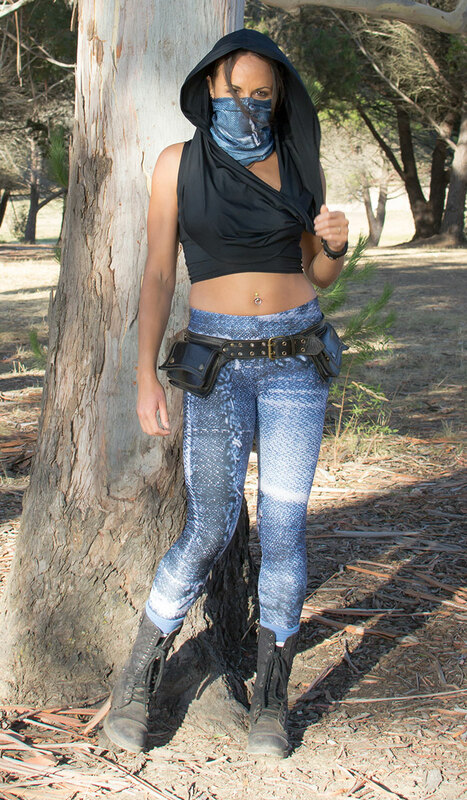 This is a review of the ethical Burning Man inspired jeans from Sonas Denim, and I have to say I am totally in love with this brand! I can’t even remember how I stumbled across them…probably because I was so immediately impressed that I forgot how it all came to be. Being a huge fan of music, I always gravitate to apparel brands that are inspired by rock n’ roll and the like. Just a little over a year ago, you may remember me bringing up Nok Nok, a London-based denim brand that excels in hand-painted denim inspired by “vibrant subcultures mixed with the freedom, hippie vibe and nightlife from Ibiza, the Spanish island in the middle of the Mediterranean sea.” Of course this caught my attention, being a DJ myself and dreaming of making the notorious party capital of Ibiza a vacation destination some day. Angel NokoNoko is the designer behind the brand Nok Nok, and he and his sister Montse are both from Ibiza. Angel is actually an electronic music DJ himself! So, as you can see, I immediately felt like I could relate to this brand. California’s finally dipped into cold territory (by our standards I guess), which means I can finally enjoy some cozy layering and some fun outerwear. At least, there was one new piece I knew I had to add to my closet: The BLANKNYC Embroidered Moto Jacket in As You Wish. I saw this beauty when I was writing an editorial for Denimology back in October! It’s rare I see something and know I need it right then and there…normally I’ll step away from the computer for a bit and if whatever item I was oogling is still in my head the next day, I might come back and grab it. However, this amazing piece just screamed my name! Unfortunately, when I went to purchase it, it was out of stock almost everywhere already. I lucked out and scored it at Nordstrom! It’s been one of my favorite purchases I’ve ever made, and it’s so fun to throw on over just about any outfit for some added edge! Photos just do not do it justice…it looks far more expensive than it is, and BLANKNYC did an incredible job with gorgeous floral embroidery, studs and zipper detailing. The vegan leather feels real, too! I read a ton of reviews before I purchased it because I know BLANKNYC sometimes runs snug. Based on those reviews, I sized up and got a medium so I could layer sweaters underneath it, and I am so glad I did! So if you are as enamored as I am, I would suggest doing so as well. I’m still loving these longer summer days, but as we get nearer to Fall, I’m definitely noticing we’re having to rush out of work more often to catch a quick shoot before the sun goes down! It’s definitely tougher to keep up with the blog and Denimology reviews in the winter time because of this. Photos always look better in the early evenings due to less brightness and shadows, so it’s not like weekends can all be used for catch up. Either way, we bloggers do what we gotta do! Well it’s that time again, when I stop and think in disbelief how fast the time has gone…and how the hell I’m already one year (or two or three or…heck, 10) years older. It’s definitely scary how our relative perception of time gets shorter as we get older compared to how many years we’ve lived, making it feel like time is speeding up. At least, that’s the theory I’ve read and tend to believe. What’s hard to believe though, is that I even got into this blogging business to begin with. Only a few years ago it was just a fleeting thought with no plans to even bring it into fruition—the last time I had even attempted to start a blog was on Blogger in 2009 when I thought I would document the planning of my wedding. I did squeeze a few denim-related posts in here and there but only had one follower (my fiancé’s sister) and I just didn’t feel a drive, passion or motivation in general to continue beyond only a handful of posts. That probably lasted about three or four months. Perhaps I wasn’t as well rehearsed on how to promote a blog—social media was already a strong point of mine, as was networking and web development, but I definitely didn’t know as much about marketing or how to properly promote posts cross-platform as I do now. Flares are really growing on me. The raw hem thing doesn’t hurt either!! This is the AGOLDE Madison 70s Flare in Starwood Distressed that I recently received for a Denimology review, and I am absolutely loving them. I wore them with a black lace headband from CVS, my Lucky Brand Whipstitch bag (yet another eBay score) and a crop tee I got from American Eagle Outfitters last year to showcase my high rise jeans during product reviews. I had so much fun with this shoot! My hubby and I ran out as quickly as we could after work to catch the sun before it went down in a local park, and the light was just perfect. 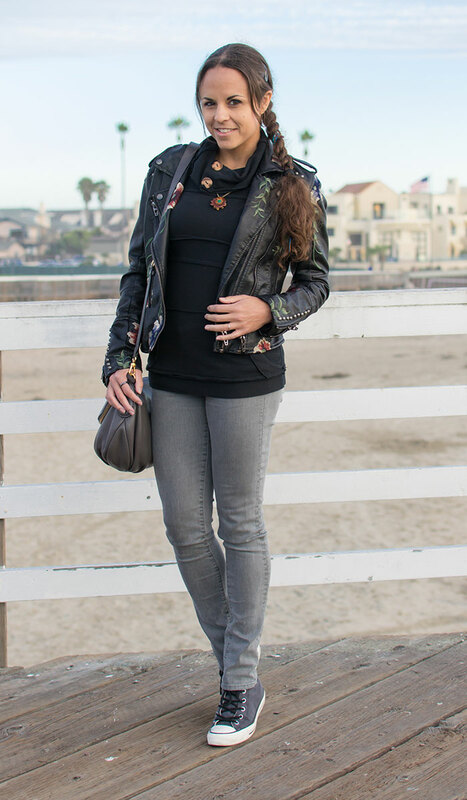 Vintage looks are so in right now and although I don’t yet have any true vintage jeans, I love the vibe and suddenly my skinny jeans are getting some decent competition!